When I think of Mongolia, images of Genghis Khan, the Gobi desert, and nomadic herdsmen pop into my head. We landed in the capitol city of Ulaanbaatar, where about half of the country’s three million people live. 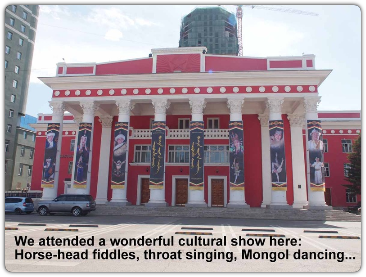 For a couple of days we enjoyed getting to know the city culture: a blend of the old Mongolia and the new. We attended a cultural show that should not be missed. The theater, performers, costumes, music, were all fantastic. I especially enjoyed the music from the horse-head violins and the lung and throat singing. The only performances I didn’t enjoy were what they call “long songs” and “short songs” – which only sounded like high pitched screeching to my untrained ears. We visited a couple of interesting museums, and saw petrified dinosaur eggs and a nearly perfect dinosaur skeleton. While we were taking in the sights on the city square a local TV reporter approached our guide, Mala, and asked her if they could interview Carolyn and me. 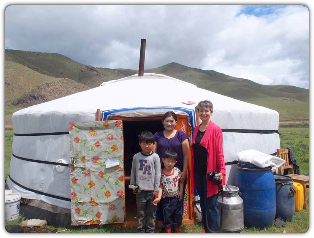 We gladly consented and had fun answering their questions while Mala translated for us, such as why we choose to spend time in Mongolia, where were we going outside the city, and what was our impression so far. We didn’t think much more of it, but that night at dinner Mala asked the manager of our restaurant if she could turn the TV to the channel the interview was to be shown. At 7:00 PM the local news came on and later in the program there we were! It was fun to see myself on Mongolia TV, with subtitles, no less! Ulaanbaatar has some really great restaurants and hotels. We enjoyed the food all over the country. 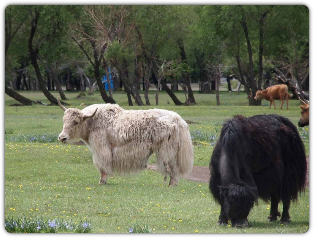 We drove an hour or so into the countryside and stopped to take pictures of some yaks. Our guide knocked on the door of the nearby ger (the traditional nomadic round mobile home) and asked if the lady of the house would talk to us. She agreed and invited us into her tent home, and proceeded to serve us a milk and salt and tea hot drink that was really good! Along with the tea she offered other solid milk products – a kind of yogurt cake, along with wheat rolls and butter. We asked her questions about her life and played a bit with her two sons: four and six years old. Her husband and some other relatives had taken their herd of goats to higher ground for grazing, and they’d be gone for several weeks. She leads a very solitary life. We appreciated her hospitality very much. We left the city and flew to the central part of the southern Gobi Desert. Our driver picked us up in his Lexus and drove us to our lodging at the Three Camel Lodge. We slept in a ger with a luxury no nomad has: an attached bathroom. Our heat for the night was provided by a wood burning stove in the middle of the room. 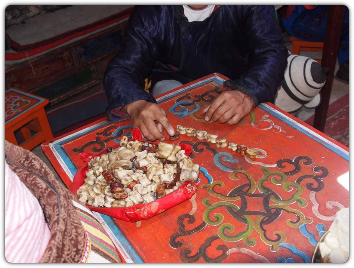 This night our guide Mala taught me to play a traditional Mongolian game with the ankle bones of sheep or goats. The next day I had time on my hands and engaged the 8 year old daughter of our cook in the game. We couldn’t speak the same language verbally but we enjoyed each other’s company playing with sheep bones! Ger construction is interesting: usually made of homemade felt and a wooden frame. The one room has straight sides and the roof is tapered up to a hole in the center to allow smoke to escape. Gers can be dismantled in a couple of hours and the family moves when their herds need to follow the grass and water. The grandparents of our guide, Mala, still live in a ger and are nomads, and they raise many sheep, goats, and horses. The gers we visited contained beds, a chest of drawers or two, table and stools. Pictures of relatives are usually displayed. 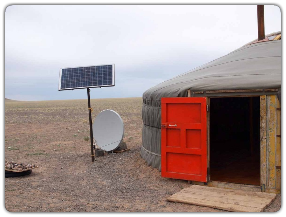 One family we visited had a TV satellite dish and a solar panel outside their ger, several vehicles and a cell phone. There is poverty and hardship, but some of these families can be quite wealthy, and all are as nomadic as their ancestors were a thousand years ago. 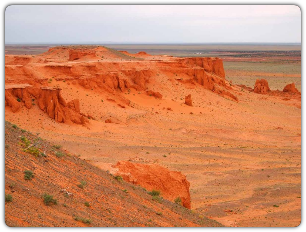 The mountains in the central southern Gobi are beautiful! I was surprised to see that this part of the Gobi isn’t brown, but green! It’s pretty well covered by a low growing plant that the animals love and thrive on. There were miles and miles of nothing but this green plant and some animals. Not a bush or cactus in sight. I had hoped to see one or two Bactrian camels, but I saw hundreds! By June the adults have been sheared and looked a bit sad but still were a treat to my eyes. I got to pet a baby camel who tried to spit at me, and to ride a grown-up one. I learned that the camel’s humps are comprised of fat, no cartridge or bone, and if they don’t get enough nourishment their humps will flop! Riding a Bactrian camel is easier than a Dromedary because the saddle fits between the humps and there's something to hold onto! I also got to ride a yak. 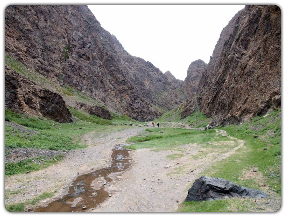 Our driver, Baata, took us to the beautiful Vulture Valley, where we rented horses and rode for about a half-mile – then walked another half-mile – through beautiful canyons, streams, cliffs…just fantastic scenery. We walked in a canyon to a patch of ice that never melts – in the Gobi Desert! 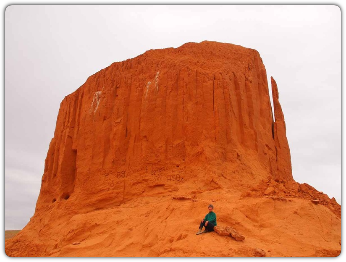 The next day Baata drove us to the Flaming Cliffs, where in 1925 the first dinosaur eggs were discovered by a expedition headed by American Roy Chapman Andrews. The Flaming Cliffs are beautiful, and I had fun walking out on some pretty scary areas. I took many pictures of the cliffs and pinnacles. This day we did see some “trees” – although in Texas we’d call them bushes and in Kentucky, where I was raised, we’d cut them down! I had a great experience in Mongolia and recommend the country to anyone who wants to get a bit off the beaten path. Our tour company (Bestway Tours and Safaris) and drivers and guide were just great, as were our accommodations and food. If I had the trip to do over again I’d add an additional day so we could visit the sand dunes in a different part of the Gobi. The people we met were extremely friendly, helpful and welcoming. People in the tourist industry speak English and as we had a guide and driver we encountered no language problems. 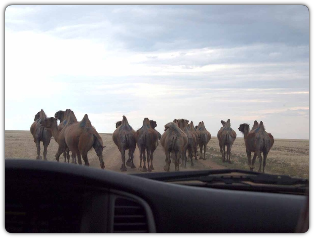 There are virtually no road signs in the Gobi we visited…I’m not sure how someone on their own would navigate there. Speaking of roads, the roads outside the city were pretty terrible. The temperatures in the winter are brutal, but in June the weather was perfect.